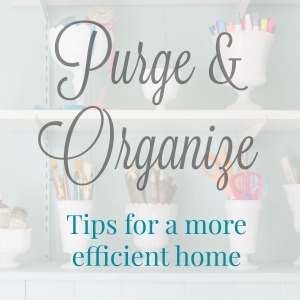 Over the past year I've been purging and organizing parts of our house. It's an uphill battle sometimes, but I've made lots of progress and love being more organized. Somehow I feel like I can breathe better when things are in order, know what I mean? 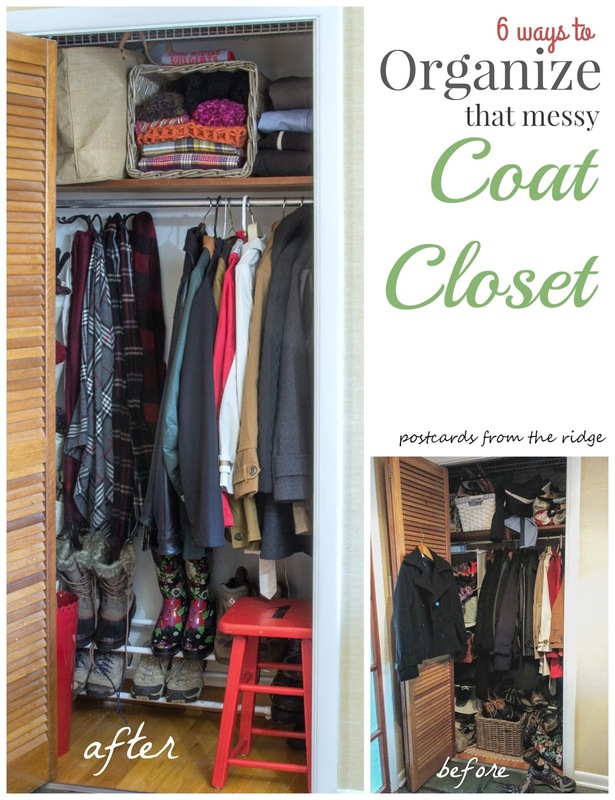 The most recent spot I organized is our coat closet, and today I'm sharing 6 simple things that I did in there. Here's what it looked like when I started. Too much stuff and an inefficient system. 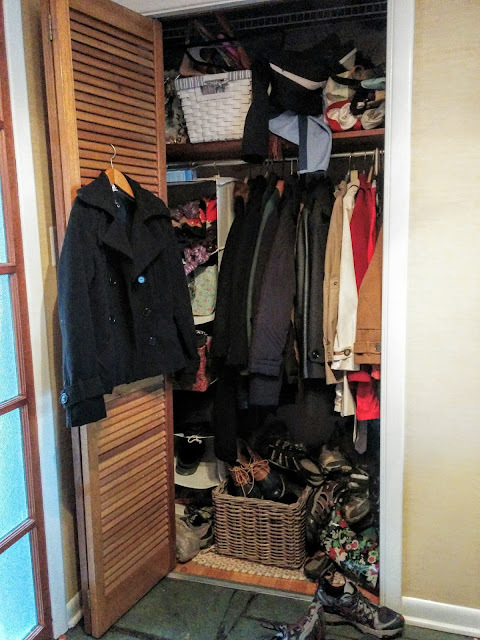 I purged many of the items and removed the hanging shelf system that wasn't working for us. I'll use it somewhere else, probably my craft room closet. After just a couple of hours it looks like this. Such a difference! 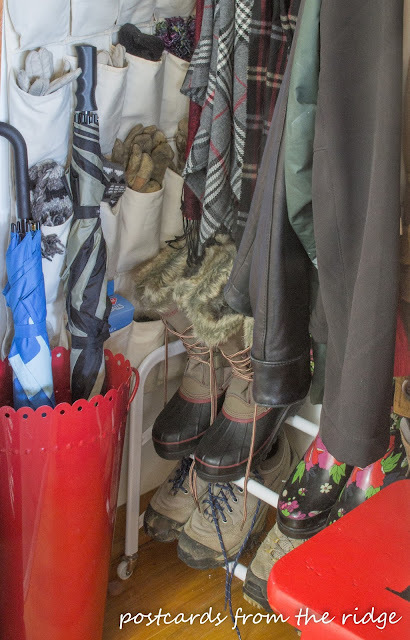 It's nice and neat and has all of our coats and snow boots, rain boots, hiking shoes, and more. It might sound silly, but I open the door every time I walk by here just to see how nice it looks now! Don't worry, I'll get over it soon! I attached a 5 arm swivel hook to the back wall for long scarves. They actually make the space look pretty now that they're displayed and not hiding up on the shelf! 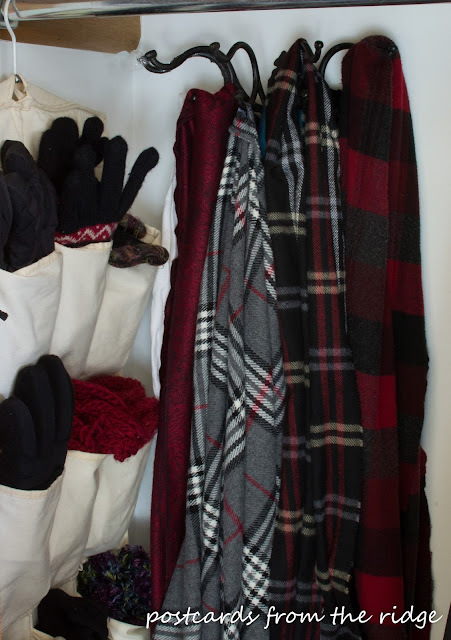 I used a pocket shoe organizer for our winter hats and gloves. Now we can easily find what we need and put them away when we're finished with them. Ours (that we've had for years) has a hanger on it. You could use on over-the-door organizer if you don't have a bifold door. Or you could attach it to your wall with screws or nails. Easy as pie. I moved the basket that formerly held summer sandals up to the shelf, turned it on its side, and added bulky scarves to it. I folded them so I could easily see them. 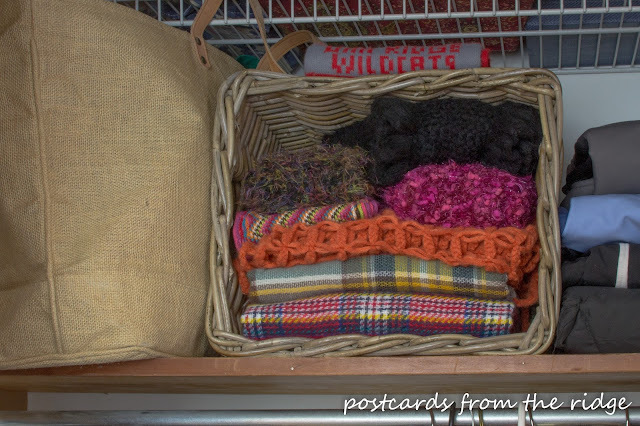 I also corralled all of my totes and bags into one large jute bag. It's now a bag of bags! (You could also hang them on hooks attached to the back of a door). And on the right, I neatly folded and stacked the exercise jackets and ski pants. Our shoes are now up off the floor on a shoe rack. And our umbrellas are housed in a tall flower bucket. 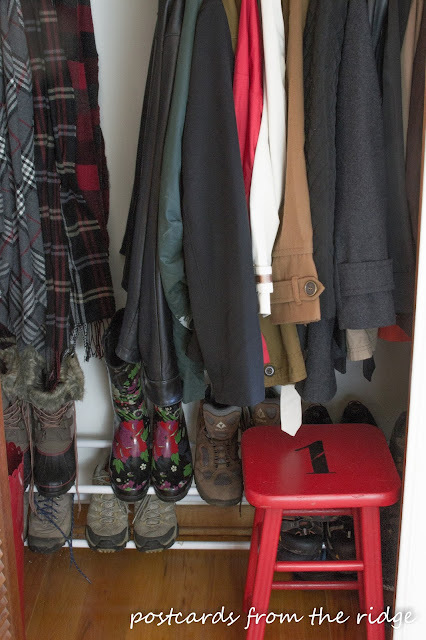 I emptied so much out of the closet that I had room to add a small wooden stool. You could use a small bench as well if you have the room. What are some ways that you organize your coat closet? 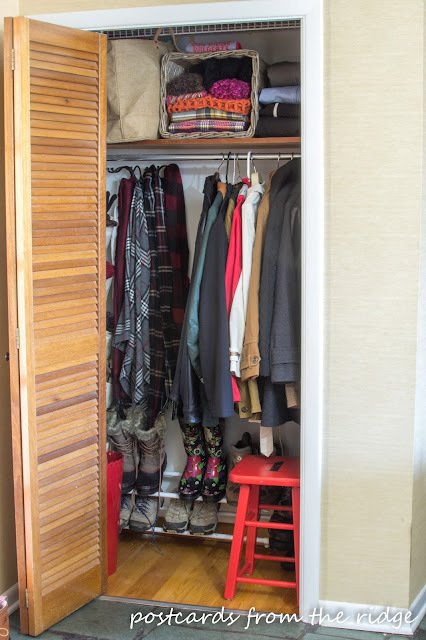 Or any closet? I'd love to know your suggestions since I'm working my way through the entire house. Shoe rack - We've had ours for years, but there's a similar one here. 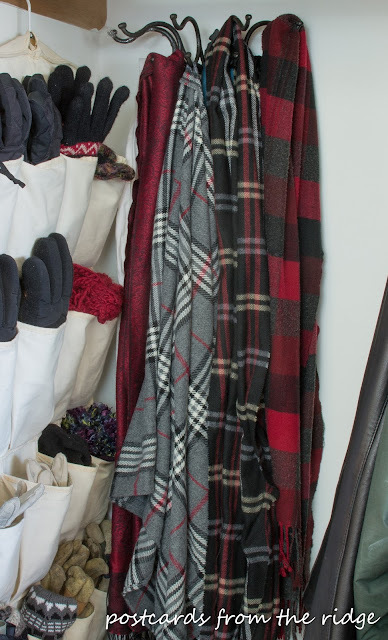 Swing arm rack for scarves - here. Large jute tote bag - here. Wooden stool - similar unpainted style here. 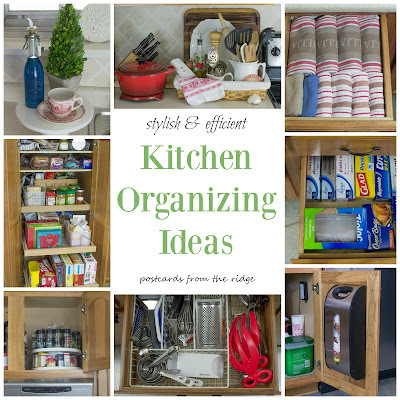 Kitchen Organizing Ideas - dozens of tips for organizing your entire kitchen and pantry are here. 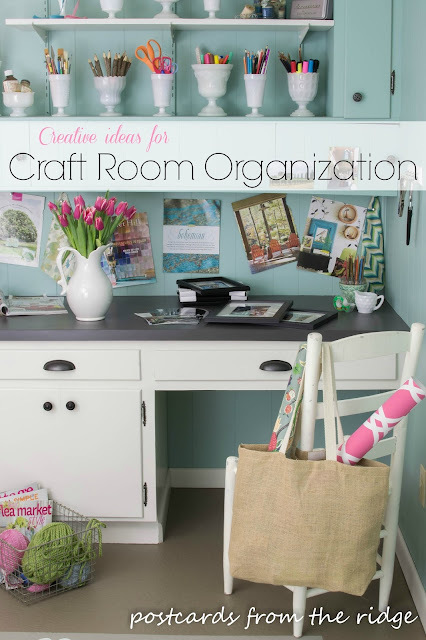 Craft Room Organization - several different ideas to store and display your craft supplies can be found here. 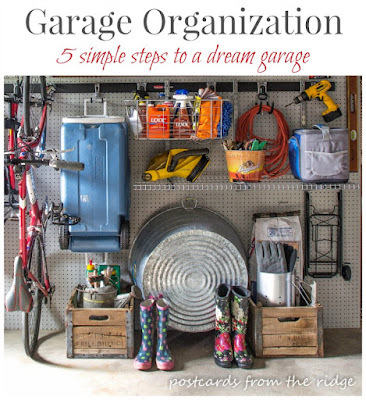 Garage Organization - See how we transformed our garage from a disaster zone to an organized space here. 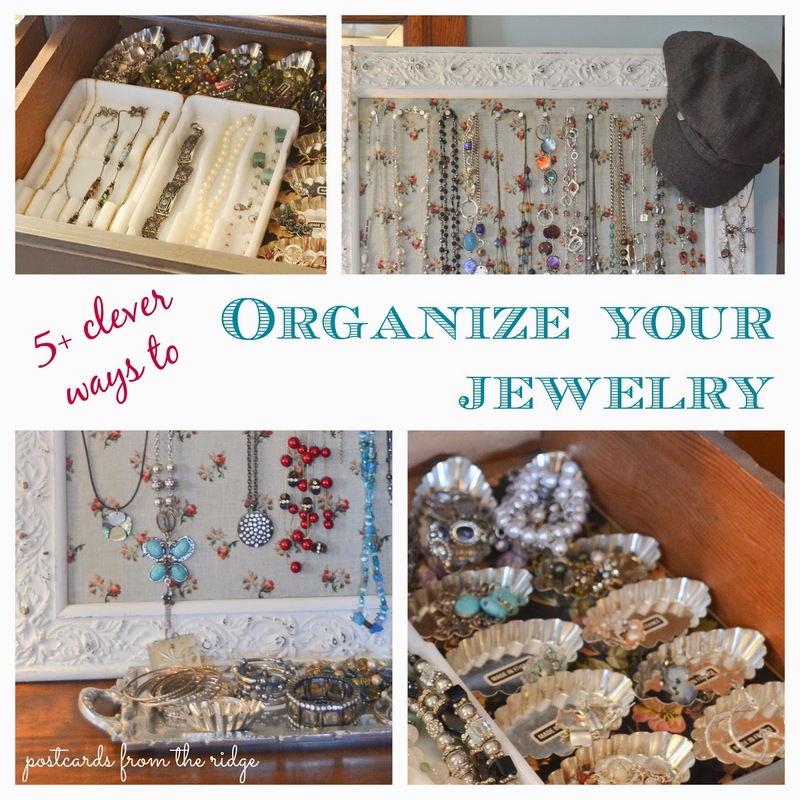 Jewelry organization ideas can be found here. 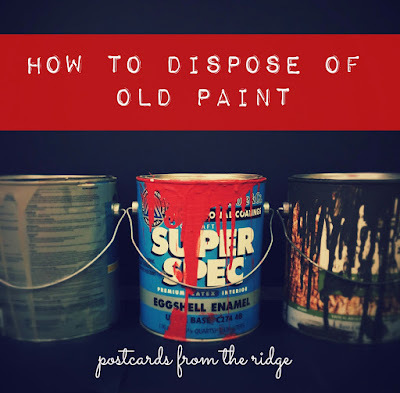 Find out what to do with old paint from the garage here. See all of my organizing posts on one page here.